You can waste all day trying to find the best ratatouille recipe from hundreds of food sites, reading each recipe and hoping for a photo or review to give guidance. Instead, give Punchfork a try; it uses tweets and Facebook likes to rate recipes by popularity from top culinary sites such as 101 Cookbooks, Serious Eats, and The Kitchn. You can search Punchfork by recipe name or ingredient. 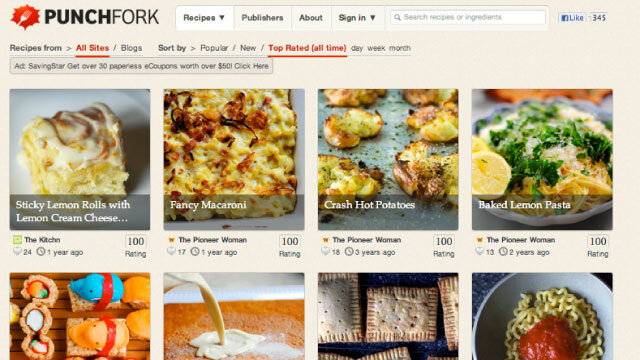 Search results include a photo, popularity rating, source web site, and social activity mentioning the recipe. Clicking on the recipe will give you the full ingredients as well as options to share the recipe on your own social networks, but you must follow a link to the originating source for the full recipe. I like Punchfork. It currently has a few thousand recipes from 35 major and minor culinary sites. My search for ratatouille resulted in 32 recipes, all with glorious photographs, fromratatouille phyllo wraps to Pixar film Ratatouille’s version of ratatouille. This entry was posted on August 20, 2011 by Durdle. It was filed under Idiotic Crap .